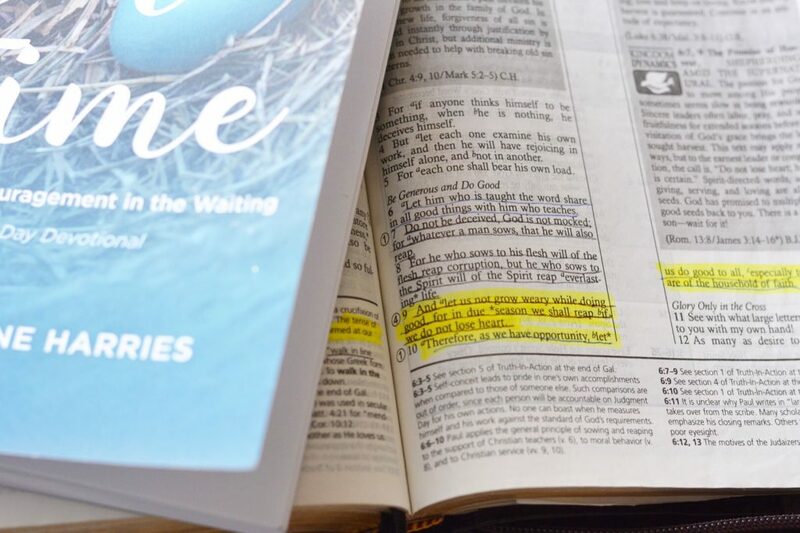 My friend Caroline was obedient to what God called her to do, and this 60-day devotional is the fruit of her obedience. 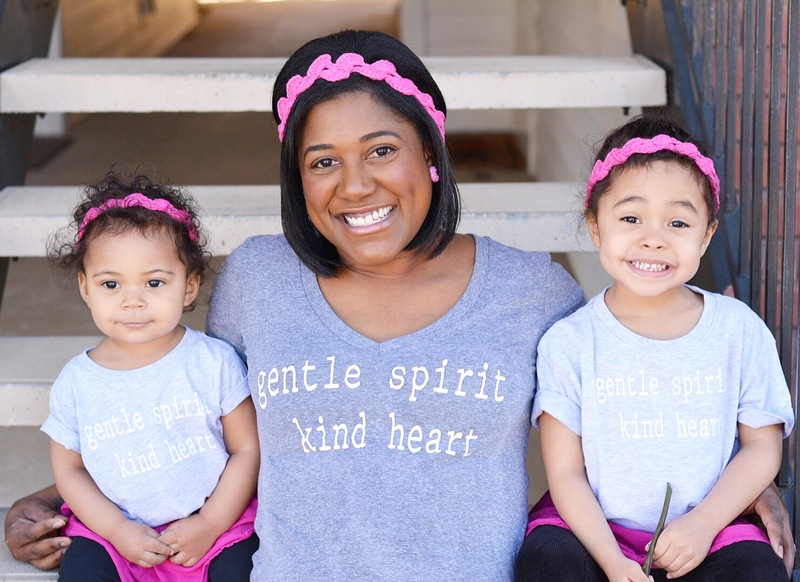 On her blog, In Due Time, she candidly shares of her hope and struggles as she and her husband stand in faith believing for their miracle babies. She also shares of the heartache her family endured in the wake of her young nephew’s tragic death. It’s evident that this devotional comes from a very real and transparent place. It is also evident that Caroline takes the Word of God seriously and she reminds us, daily, of His promises. What I love about this devotional is that it truly meets you where you are. You might not be faced with loss or infertility, but we are all waiting for something. Are you waiting for a job? That adoption to be finalized? Whatever it is, Jesus has not forgotten you. Whatever it is, it’s not too big for God to handle or too small for Him to care about. 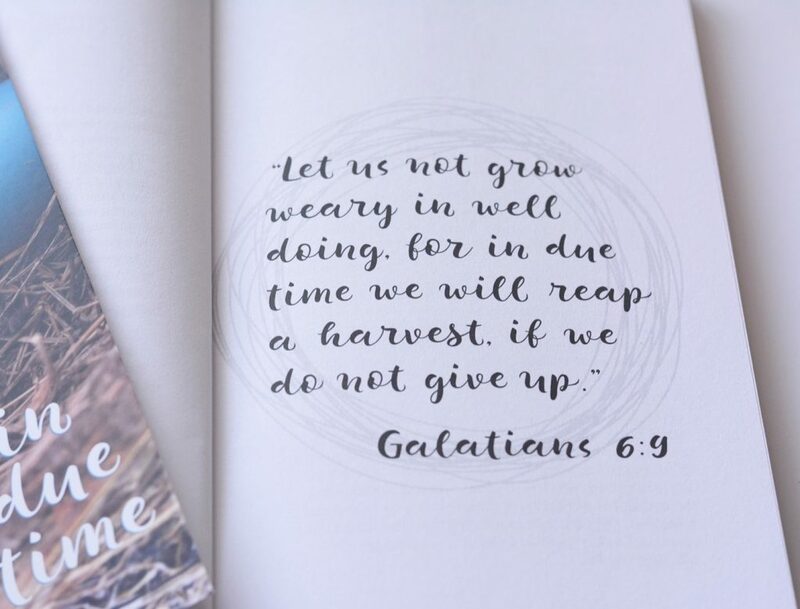 ‘In Due Time: Hope & Encouragement in the Waiting‘, points you back to these truths and is truly encouragement for the weary soul. 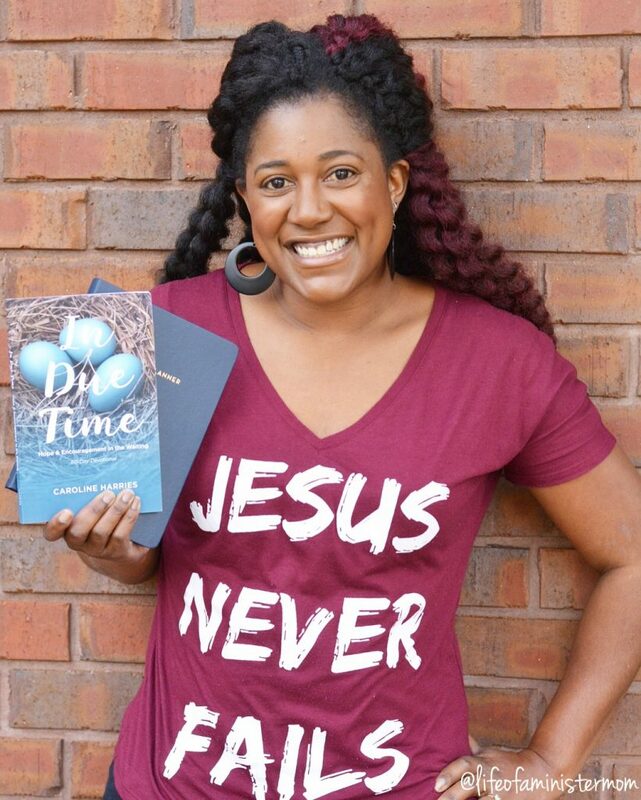 This book would make a great gift for you or someone you know during this holiday season, and it’s sure to be a blessing year round! You can make a purchase here, and save 10% off plus receive a free bookmark with code lifeofaministermom10! 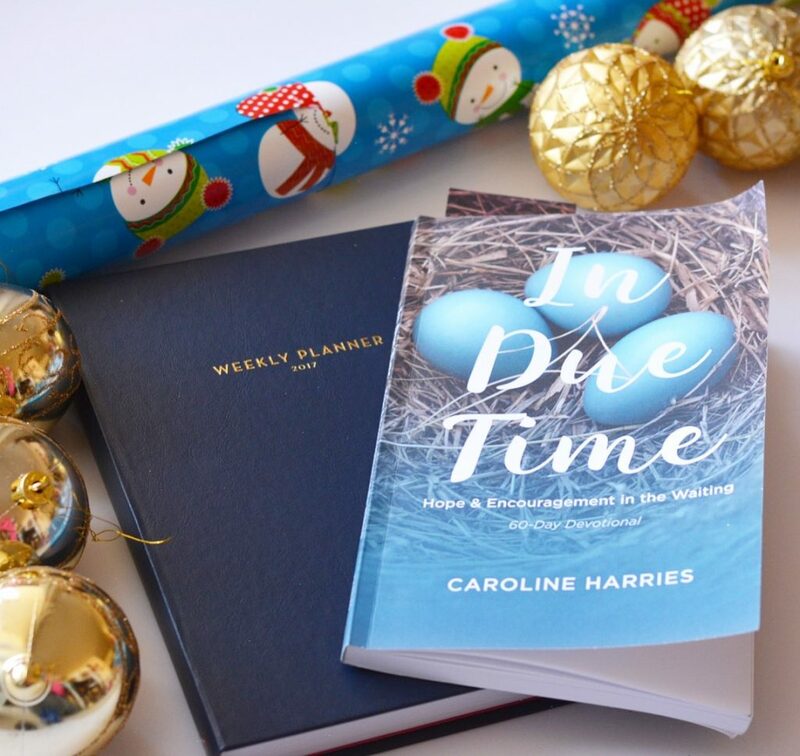 Stay up to date with Caroline on her blog, Facebook, Instagram and Twitter! And that’s not all!! 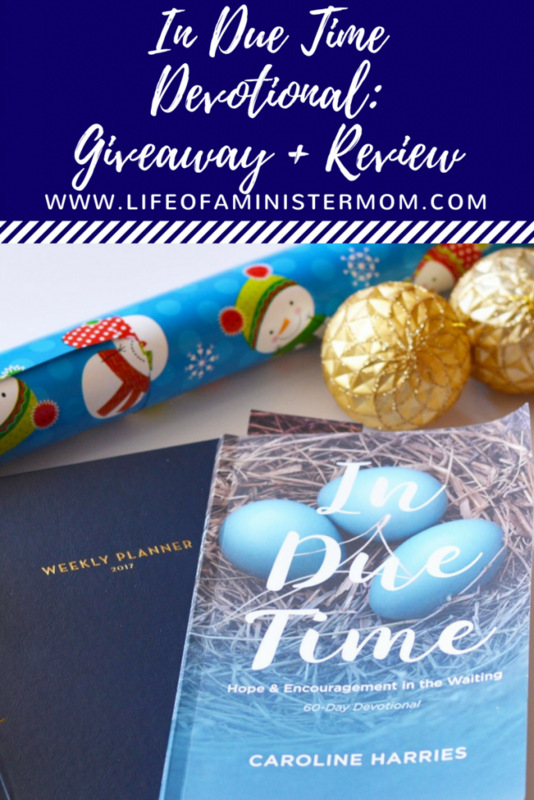 We’re giving one lucky winner a copy of this book AND a 2017 Anchored Press Weekly Devotional Planner. I contributed to this planner so it’s extra special to me! My dear friend Caroline sent me this book, but my thoughts on how it blessed me are completely sincere. God is good! Such a great message! I will wait for all great things to happen. Yeah!! I’m so excited for you! I’m glad that you are using your gifts to bless other women. I’m sure this will be a blessing to many. I’m thrilled for Caroline and looking forward to seeing how God will use us all in the new year!! That planner is so cute! and it sounds like a great book! I love my planner and I’m so happy I have this book!! Thanks!!! Love love love. What an honor to read this review. As always, you look stunning in your photo. Am I allowed to enter to win? Haha, seriously – would love this planner!! Lol. The planner is pretty great. 😉 And no, thank you!!!!! Great post and review!! Sounds like a very encouraging and uplifting book! Also, I really like the cover of it!!!! post and review! It is so uplifting!!! And if I remember correctly the cover was a photo her husband shot a while back. So cool!! I love this post. I am totally guilty of wanting instant gratification. Definitely something I need to work on. Same here Lindsey. This is such a great reminder to trust God’s timing! Yes!!!! She is an encouragement to so many! what a beautiful giveaway patty! i love caroline and so proud of her! I’m so proud of her too!! Thanks Chanel! I love this! This sounds so encouraging and uplifting. I know someone who has been struggling with trying to conceive and they could really use this! I’m sure this would lift her up so much! It’s so encouraging! Caroline is amazing and such an inspiration! So are you Patty! What a great giveaway! She’s so amazing! Yes you do! Maybe you’ll win! I’ve heard so many great things about this devotional! It’s all true! It’s amazing! I have one and I absolutely love it! Caroline is such a talented writer! She’s the real deal!!! And this planner is pretty fabulous if I do say so myself. I already bought this book for myself and love it. I would give it to my friend if I won. Trusting God to heal my ankles in 2017! This would be such a thoughtful gift. And Amen!!!!! I love this!! I’ve been wanting to get this for my brother in law & sister in law who have been waiting a painfully long time for God to bless them with a baby! Oh Erin! I love your heart! This would be a wonderful gift for them. Praying for their sweet miracle babies too! It would be amazing to win this book and planner, they both look amazing! I am believing God for complete physical healing from long term effects of chemo treatment. Full and complete healing in Jesus’ name! Praying for you Kimberly. Best of luck!!! I love this book! I know a friend who would love this too! It’s so great Dawn! Glad you agree!! This sounds like such a wonderful book! I love finding new inspirational books to read, this sounds amazing. Absolutely beautiful. I needed to read something as inspiring and heartfelt as this today. That means a lot to me Erica. *Hugs* friend!! What a blessing! I know many people who could benefit from this, including myself! That is our prayer Maggie! Thanks!!! Thanks for sharing! And I entered! I am so excited about Caroline’s book! And YES, I can get so frustrated and impatient when things don’t happen in my timing! Silly me. When will I learn that His timing is best?! A lesson I have to re-learn often!!!! After I had my miscarriage last year, waiting on God for the blessing of another child was hard!every month brought heartache and frustration, but then the Lord blessed us with another child! I’m still learning to wait on His perfect time, and plan. This devotional will help to encourage that! I’m so sorry for your loss but praising God for your precious baby! Blessings to you!! This sounds like such a wonderful devotional ❤️ And such a great opportunity for you about the Anchored press thing! Thank you so much Kimberly!!! Awesome Angela!! I love her too!! I needed to read this today. This devotional looks amazing in so many ways! It has certainly blessed me! What a wonderful book! I’ve been very anxious about 2017. I am going to start working after 5 years as a stay at home mom and my twins will be starting school and leaving me for the first time! I’m very nervous and scared but I have great trust in God! Oh wow, that is quite the transition!! But you won’t be making it alone Mallory. The Lord is with you!! So true Patty there really isn’t anything in this life that God cannot handle and most the time He is waiting on us. This sounds like an amazing book too. Yes!! He’s waiting for us to truly trust Him! So good!! I love uplifting messages! This is a good reminder to be patient and have faith in God’s timing. Absolutely Emily! Have a merry Christmas!! Great post and review. I needed to read this today as the past 3years have been full of set backs and turbulence while trying to conceive. Thank you for sharing. Hoping I’m the lucky winner! You are the winner and I’m so happy for you!!!! This sounds like something I need to read!